Hal Junior: The Secret Signal. 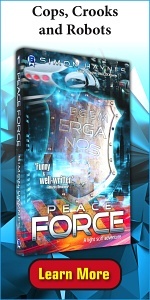 Book one in the Hal Junior middle grade science fiction series. 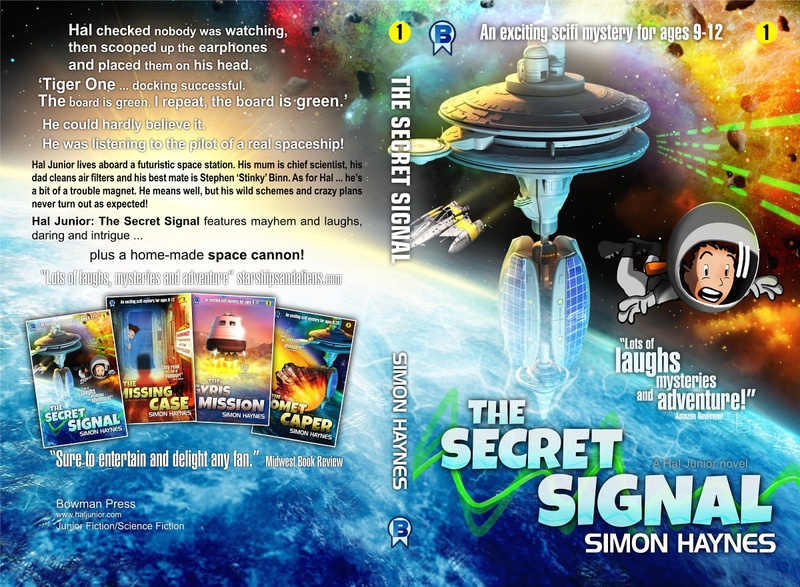 "A thoroughly enjoyable read for 10-year-olds and adults alike." "Sure to entertain and delight any fan." "The story zips along with lots of laughs, mysteries and adventure." The Secret Signal is the first book in a thrilling new series by award-winning author, Simon Haynes. No swearing and no adult concepts ... just good clean fun. Hal's way smarter than the adults on board, but instead of flying spaceships or inventing killer robots, what do they have him doing? Chores! Chores and homework. Could life get any duller? Aboard the visiting ship, Hal uncovers a secret plot. A plot involving kidnappings, sabotage and more. He tries to warn the scientists aboard the space station he calls home — but as usual, nobody believes him! Well, Hal's not giving up that easily. He decides the only way to save everyone is to deal with the evil plotters himself — using a giant, home-made space cannon! About 29,000 words - 200 pages - with 42 small illustrations, diagrams and sight gags. 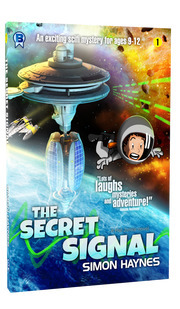 The Secret Signal has been described as 'Dennis the Menace in space' and 'Just William in space'. It's an adventure, a thriller and a comedy all rolled into one. There's no swearing and no adult concepts ... just good clean fun. Readers aged 9-12, and adults who still remember their inner child. Children in upper primary school (middle grade and/or middle school) will really like it. It should also prove popular with older readers who still enjoy fun and adventure.